« Walden Pond Junior Ranger Programs CUBS, 6-8 year olds July 8-12, 2013 9:15-10:45 a.m. BEARS, 9-11 year olds July 22-26, 2013 9:15-10:45 a.m.
FUN TIMES: The Amusement Park at Walden Pond Wednesday, July 31st, 5:30-6:30 p.m.
Meet a Park Interpreter at the Thoreau house replica for a walk to the back of Walden Pond where once the voices of merry making from the Amusement Park echoed by the shore. 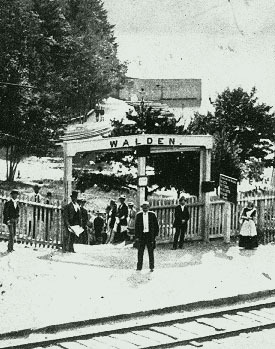 Learn about the boat rentals, dancing, and picnicking of “day trippers” coming from the city on the railroad who came in large numbers starting in 1865. Be prepared for a moderate 1.5 mile walk. This entry was posted on July 2, 2013 at 3:02 pm and is filed under Events, News. You can follow any responses to this entry through the RSS 2.0 feed. Both comments and pings are currently closed.